WHAT WOULD A WINDFALL SOLVE? Everyday I hear at least one person say that they either want or need to “hit” the lottery. When asked what they would do with the money, the typical first response is that they would quit their job. After that , people usually begin listing all of the things they would acquire with their new found wealth. While a monetary “windfall” sounds like a dream come true, the question that should be asked is what will money do for us. The ability to buy things will last as long as the money does.I once worked with a woman who had won $50,000 on a scratch ticket. She was the payroll clerk at the company. Her name was Carol, and she told me her story. Carol went to the corner store on payday and asked the attendant for a ticket. Carol said she did not care which one it was. When she discovered that the ticket she had was a winner, she quickly went to lottery headquarters and received her check. Of course the check already had the state taxes taken out of it. Carol then deposited the check in her bank and promptly began planning an expensive trip for both her and her husband. They went away for two weeks and when they returned all of the money was spent. Carol said that the memories from her trip were what kept her going even when things became difficult. She was the only one working,as her husband had been laid off. The longer her husband remained unemployed the more difficult their relationship became. Eventually they ended up getting divorced.Looking back on the events that lead to the end of her marriage, Carol realized that she should have held on to that money. She said it would have paid the bills they could not afford once her husband’s unemployment ran out. Upon further reflection Carol came to the conclusion that her marriage would have ended anyway. Her husband was jealous of her ability to leave home and go to work. For him everyday became much like the one that preceded it. Without a place to go or a purpose of some kind to fulfill, he became lost. Carol may not have her $50,000, but she has her memories of a great trip and a job to go to everyday! 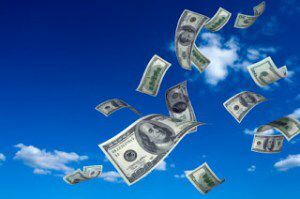 What would a windfall do for you? What choices would you make?